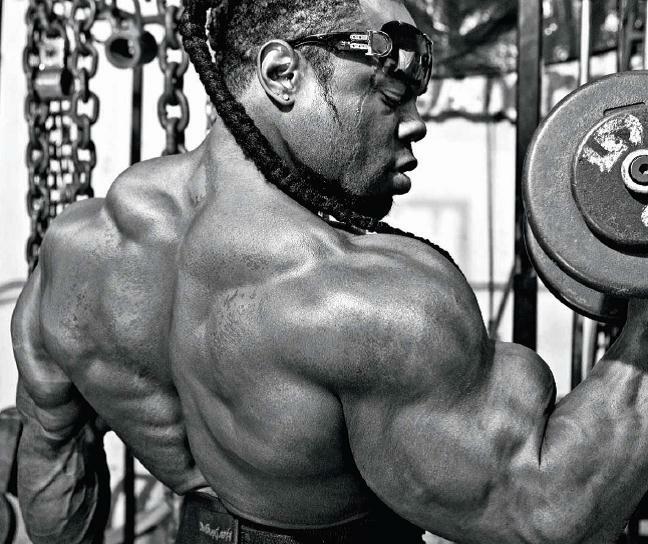 When Should You Use Isolation Movements? Compound movements will always be king. I stress it in all of my writing and programs, and no matter how you spin the argument, you must recruit more muscle to build more muscle. The beginner lifter, or the person struggling to add mass or strength should be focusing on compound movements. That’s not to say that isolation movements and bodybuilding does not have its place. Quite the contrary in fact; you just need to know how to use isolation movements in your training to maximize your results. The following situations are times where I incorporate isolation movements. Accessory work is vital to improving your numbers on things like overhead press, squats, and deadlifts. A big part of that is isolating the primary and secondary movers on those lifts and building size and strength in them. If you want to be a better presser, you have to build up your triceps and shoulders, so things like tricep pushdowns and front and side delt raises are great movements. Want better squat and deadlift numbers? Glute ham raises and RDL’s are crucial to isolate your hamstrings. 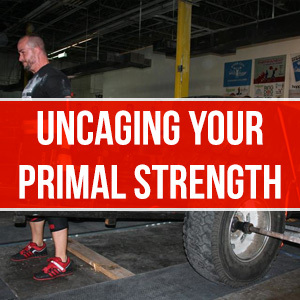 This situation is, by far, the most prevalent time I and a lot of my Primal Strength Gym members use isolation, and we usually hit at least one isolation movement per training session. Arms tend to respond well to higher-volume training, and while I train my arms indirectly through pull-ups, row variations, and heavy pressing, it may take some added sets of curl variations and tricep work (push-downs, dips, close-grip bench) to add mass to your arms. I tend to do a lot of direct arm work on my lower body days, as opposed to upper body days where my arms already get a lot of indirect time under tension. I also use movements like light banded curl variations for tendon health and rehabilitation from strained and achy muscles. 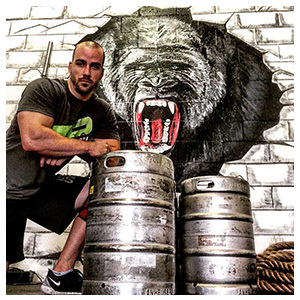 If you are doing a lot of compound lifts, especially if you split your routines into an upper-lower split like I recommend, chances are you will need to incorporate some isolation movements to bring up neglected muscles, imbalances, and weaknesses. Hamstrings are the prime example of this as it seems the vast majority of the population has weak hamstrings. Upper back can be another common area, especially if you train a lot of compound movements. For example, outside of deadlifting and farmers carries, I have to be conscious to make sure my upper back is getting trained frequently enough. So at least once a week, I’m dedicating some time to isolate my upper back with face pull variations and even shrugs. 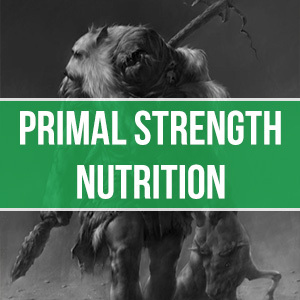 Those examples aside, directly targeting and isolating any muscle that is lagging behind in development is a great strategy if you aren’t getting the results you want from heavy compound lifts. Sometimes, especially for more experienced lifters, the solution to build more muscle mass is to increase training volume. If you are doing a lot of compound movements and recruiting a ton of muscle, your physical and neurological exertion will be elevated, making it very difficult to increase your training volume effectively (and it’s stressful on your central nervous system (CNS)). Isolation movements are a great way to introduce more volume into your training to try and produce mass gains and hypertrophy, without over-taxing your body and CNS. When I was a little kid, I always envied Hulk Hogan’s “24-inch pythons”. Now that I am a little older and a little wiser, I take a more well-rounded approach to building my arms that not only gives me more mass on my biceps and triceps, but improves my overall body mass and strength as well. Want to make sure your gun show is a hit? Let’s break down a good strength training approach to building bigger arms. These are my go-to tricep builders. I usually hit these after a heavy pressing exercise like the bench or overhead press. Knocking out 4 sets of this with 12-16 reps should do the trick. Once you can crush these with regularity using bodyweight, load up some plates on a weight belt or strap some chains around your neck and get to work. Avoid doing these with your body straddled between 2 benches, feet propped up on one and your hands on another. This style is a recipe for a pec tear and is not good on your shoulders. Go with the classic approach on a dip stand. Make sure your elbows remain tucked in; no flaring out like a chicken. Everybody can do curls. These are great bicep builders and an exercise you can do with a relatively high frequency since your bi’s are able to recover so quickly. I tend to favor them with an EZ curl bar. A straight bar is okay if that’s all you got, but they can be hard on your wrists and elbows. I don’t ever recommend curling heavy. 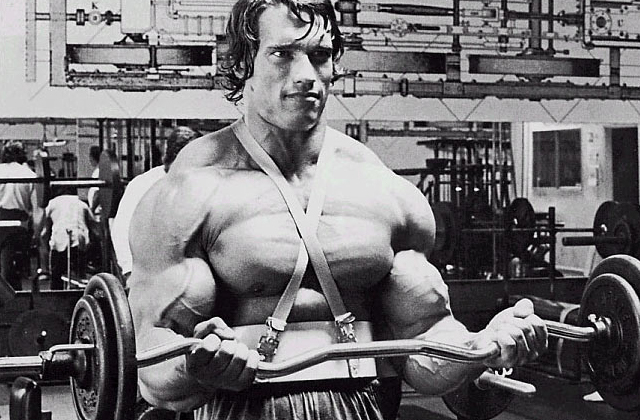 Curl for “the pump” by using high volume and moderate weights. Rep ranges should be in the neighborhood of 8-20 depending on the resistance and keep your rest periods low. Work the variations into your training. Concentration curls, reverse curls, and dumbbell work are all good. One thing you don’t see much are power curls, but if you need to get some volume in with heavier than normal weights, these are a great way to do it. Aside from dips, this is one of the best tricep exercises you can do. Take a narrow grip on a flat bench, and press a loaded barbell. Obviously, you will be pressing much less weight than a normal bench press, so pick something you can handle for 16-20 reps. Again, you could work these in after a normal pressing exercise. Here I like to keep my tempo pretty fast, almost as if I was doing speed work per Westside methods. Focus on keeping your elbows tight to your body to emphasize your tri’s. At least 4 sets here with 12-20 reps a piece. Focus on volume, not intensity. When you are doing direct arm work, those are the 3 exercises that I would emphasize. Others, like skull-crushers or dumbbell presses are fine, but listen to your body. If you are experiencing elbow or shoulder pain, ditch them. Injury simply isn’t worth it, and the 3 I laid out above work. No need to re-invent the wheel. Getting big guns is all about volume. 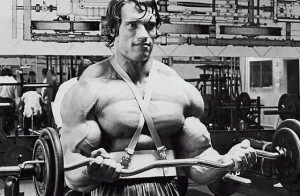 Volume may be the most important factor to gaining mass in your arms; more so than it is in other parts of your body. So don’t waste your time trying to train too heavy with curls or dips. Gradually build your strength but maintain high rep ranges. Your arms are quick to recover too. Hit them with a higher frequency during the week, capitalizing on a day or two of rest instead of 4 or 5. Big arms are based around big triceps. 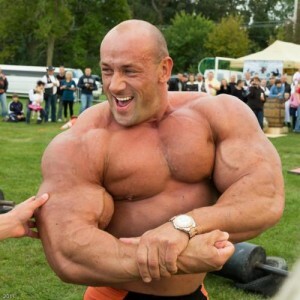 A nice peak to your guns looks nice and all, but arm size and strength is mostly concentrated on your tri’s. So if you want bigger arms, what you are really saying is that you want bigger triceps. Plus, the bigger and stronger your triceps are, the more success you will have in your other big pressing lifts like the bench and overhead. In fact, I train my triceps strictly to get better at those lifts, rather than just trying to get bigger arms. If you want bigger arms, I’m guessing you want mass everywhere else too, so the more you can press, the better off you will be. This is by far the most important principle to remember. If you take nothing else from this post, please at least take this. Spend less time doing direct arm work and hit them indirectly instead. This will free up a ton of time for you to build more total body mass by focusing on compound lifts like the bench, overhead press, row variations, pull-ups, pushups, etc. Even though you aren’t isolating your arms, pull-ups and row variations will build your biceps, and presses will crush your triceps. You will be hitting your arms far more than you realize and then you can supplement this work with curls and dips, albeit spending far less time isolating just one part of your body. Trust me, your arms won’t shrink if you don’t do 20 sets of bicep curls a week. I didn’t touch my arms for 6 months, meaning I only did indirect arm work, and they still grew. Since then, I’ve added curls and dips once a week in addition to standard pressing exercises on my 2 upper body days, and the gun show is in full effect. So by following this principle, not only will your arms get bigger, the rest of your body will too. If your guns aren’t growing as fast as you’d like, spend an extra 20 minutes a week getting in more volume but try not to sacrifice the other critical parts of your training. 3 exercises and 3 principles that will get you bigger arms in a hurry. One of the first things I ask people when assessing how and why they train is to ask them who they want to look like. The answers I get are almost 100% the same. Yet, the way they train is completely out of whack with the goals they have. Let me illustrate. Take a look at the pics below. Who would you rather look like? Jay Cutler or Vernon Davis? 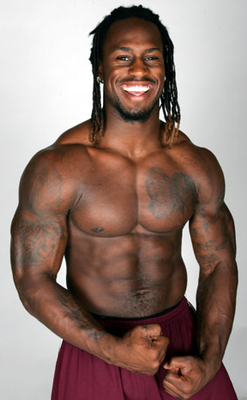 Now Jay is huge and impressive, but I’d still venture to guess that most of you picked Vernon Davis on the right. So let me ask another question. If you want to look like the guy on the right, why is it that you train like the guy on the left? 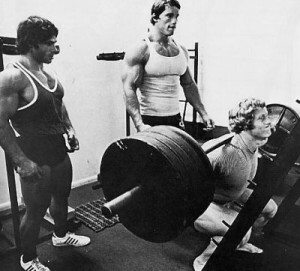 The majority of people I see walking around gyms these days are still doing the same sh*t they read out of bodybuilding mags that were idolized decades ago; body part splits, isolation movements, high volume. 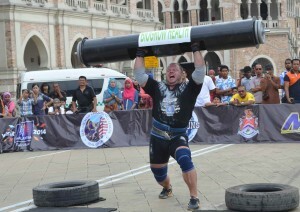 If you are a bodybuilder, have at it. But most of us aren’t getting on that stage any time soon. We simply want to get bigger, and stronger, and look good with our shirts off. Most of us want to look like our favorite athletes. If you want to look like an athlete, you sure as hell better be training like one. Compound exercises are king. Squats, deadlifts, bench presses, overhead presses, Olympic lifts. Sprint, jump, move! No more isolation, no more 80 reps of one body part training session. Total body training, or for the intermediate to advanced lifter an upper/lower split, is where you should live. Do you think Vernon spends his time doing bicep curls and lat pulldowns? The dude is training for strength and power. He’s doing pull-ups, heavy squats, clean and presses. He’s doing total body training sessions. And guess what? He still looks good doesn’t he? Ditch the bodybuilding routine. It’s time to train like an athlete.